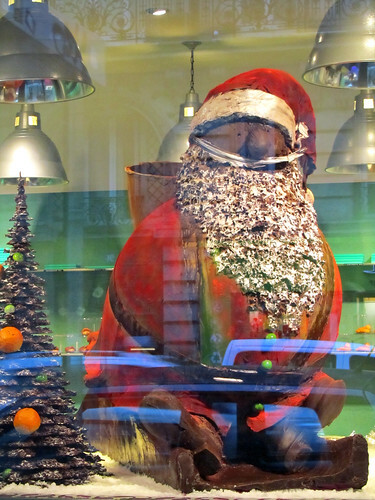 This delicious looking creature is currently attracting a lot of attention of anyone passing the chocolatier Patrick Roger on rue de Rennes – I was not the only one trying to grab a photo. Just how cool it is to have this masterpiece in your home? Set on the table, it is taller than me and even in comparing its height to mine, it’s still standing pretty tall. It makes me curious now what centrepieces have he got in his other branches around the city. There are, afterall, five of them altogether. I’m normally here, or at the one on Boulevard St Germain – about 15 minutes walk between the two. It has been a while since I last shopped there though. Perhaps it’s time to revisit and get some Christmas goodies for those near and dear. you know, i don’t think it’s for sale and even if it is, i dare not think what it’ll cost. afterall, a small egg size chocolate (which i got during easter) was already something like €5-6 each… this could be in the thousand ballpark?